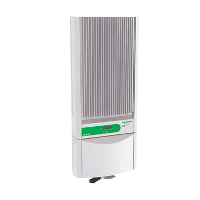 The new Schneider Electric Conext Grid Tie inverters have been redesigned to offer improved reliability and a lower installed cost through ease of installation and integrated features. The Conext inverter is a proven, high-frequency design in a compact enclosure and may be installed as a single inverter, for a single PV array, or in a multiple-inverter configuration for large PV systems. Conext Series inverters feature an NEC compliant, integrated Square D DC/AC disconnect, eliminating the need for external DC (PV) disconnects, and in some jurisdictions, AC disconnects. Sealed inverter enclosure can be quickly separated from the wiring box allowing DC/AC connections to remain intact in the event the inverter needs to be serviced. 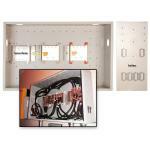 The NEMA 3R enclosure has a large wiring area with eight knockouts (¾" and 1"). The inverters are lightweight and easy to install and can be mounted side by side with zero clearance. They utilize large heat-sinks which allow for heat dispersion without the need for a cooling fan. A liquid crystal display (LCD) provides instantaneous information – power level, daily energy and lifetime production, system status, and installer customized screens. With auto-detect 240VAC or 208VAC operation, Conext inverters work right out of the box for single phase residential and three phase commercial applications. CSA Certified to UL 1741 for the U.S. and Canada. Ten-year standard warranty. The monitor easily connects to Schneider Electric Conext Series inverters using a standard off-the-shelf Cat 5 Ethernet cable. Built-in flash memory stores PV system data and makes software upgrades simple. This connection also provides power to the monitor, removing the need for a monitor power supply. It displays total PV system performance in daily, monthly and lifetime views on a graphical 128 x 64 pixel LCD screen. The display can access detailed individual inverter performance through the device list screen and it can display individual and total system performance for up to five Conext Series inverters. Wall mounting bracket and hardware included. The Communication Gateway connects Schneider Electric solar inverters and the system owner's computer. It logs performance data directly from the Schneider Electric Conext inverters, and transmits it to the included Yahoo Widget-based monitoring software for a simple and graphically rich view of system performance. In addition to data logging, the Gateway offers a web page with the ability to configure automated email reports and fault status to the user or installer. The Gateway includes both built-in Wi-Fi and Ethernet connectivity allowing for flexible and simple set up for wireless or wired connection to a router or direct to a PC. The Gateway logs and transmits system power production, inverter-specific power production, lifetime power production history (daily, weekly, monthly) and inverter faults. It can monitor a network consisting of up to 20 single-phase Conext inverters through a Cat 5 connection between each inverter and the Gateway. The Gateway can also be used with the XW Series inverters.